Police have surrounded a house where a 72-year-old thought to have a gun. Special negotiators are at the scene. 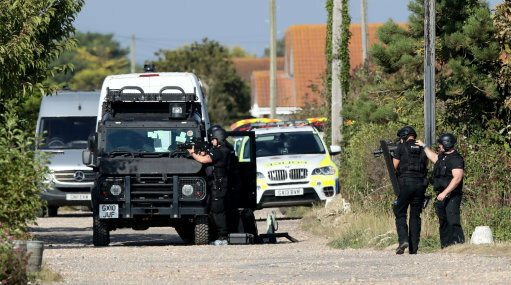 A 40-hour stand off between police and a 72-year-old man refusing to leave his house in Pagham, near Bognor Regis, ended safely just after 8.45am on Tuesday (August 30). The man had communicated with police negotiators since emergency services were called to the house in Harbour Road at 4.10pm on Sunday. Ambulance and fire services were called forward on Tuesday morning as the man threatened to set fire to the house, but at 8.42am he told police that he was leaving the property and a few minutes later, he left, closing the door behind him. He was arrested on suspicion of threats to kill and possession of a firearm with intent to endanger life. Acting Assistant Chief Constable Steve Whitton said: "This was a long, complex and challenging negotiation, but I am delighted to say that it has ended peacefully and safely as this was always our absolute priority. I also pay tribute to all the police officers and staff involved for their professionalism and determination to resolve this safely. "It has resulted in considerable disruption for residents in the area and I would like to thank them for their patience and understanding as we have strived to bring this to a safe conclusion for everyone involved. "I would also like to thank our colleagues from the fire and ambulance services who have waited patiently in support of the operation. "There will be a police presence at the house for a while, but most of the officers involved are now being stood down."